The Akashic Records tell us July promises to bring a swirling, spinning energy. I have already channeled the Looking Ahead Message for August, and it looks like we will continue to see some wild energy for a few months to come. July is just the beginning of a chapter of head spinning change (as if the world weren’t already moving too fast!). We also have Mars, the planet of “energy needing expression”, preparing to go retrograde next week. Retrograde periods highlight and intensify the influence of a planet, making us more aware of how we’re using a particular energy in our life. With Mars, it can bring up: anger, rage, explosive outbursts or aggression. What is really being triggered? What underlying issue is wanting your attention? What is your habitual response when it comes to anger? Do you shut down, suppress it or project it? Do you need to change this response? The mystical heart of the world’s religions is the identity of the true Self.The understanding of the Self is the most important insight that any individual can have in life. The Self begins with the permanent atom of being, the cause out of which the effect proceeds. We call this cause the I AM THAT I AM, the Presence of the I AM, or the I AM Presence. 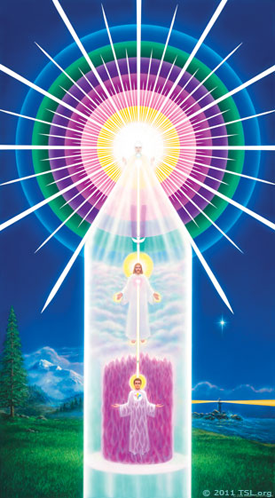 This Real Self is seen in relationship to the evolving self on a chart that is called the Chart of Your Divine Self. It illustrates so many of the cosmic truths that have been discovered by the great mystics of East and West. The Chart has three parts and, in a sense, could be called the trinity of your identity.